Uncategorized | My Journeys Through Life . . . Herding Cats In New Mexico! M.I.A. Lately . . . So, many things have happened to keep me away. Let’s see . . . first up was a little mishap which made it realoly hard to use my hand . . . Yes, folks, I did this myself, carelesness while using scissors. no, I was not running with scissors. I was trying to cut a tag off of something. My birthday dinner is waiting until probably the end of January or into February, when I am able to be done healing, and able to chew again. Then, snowmageddan Albuquerque . . .
We live outside of Albuquerque, but it hit here. I did NOT move to the desert for this, but truthfully, it was gone gone gone in about a day. And last but not least, my husband in the E.R. on January 2. So this, friends, is how my 2018 ended, and my 2019 begain. So, I’m hoping for the year to improve! So . . . This Happened . . .
I’ve been MIA here on the blog lately because a “thing” happened. My husband and I were on our way home one evening a few weeks ago, a woman hit us. Nothing broken but the minivan, but I had a lot of deep bruising, and painful (very painful!) issues with my rib cage. I was unable to manage stairs, or even lie down. So for two weeks, I slept downstairs, sitting up. Here is what my minivan looked like the last time I saw it . . .
We will hopefully have it back by the 20th from repairs. A few weeks ago, on September 26, I had a total knee replacement. I was supposed to have surgery on Tuesday and come home on either Thursday or Friday. Unfortunately, my blood pressure kept bottoming out, causing me to pass out when the Physical Therapist would get me up to walk, and I ended up in ICU, followed by going to a Rehab Facility instead of home. 😦 Well, I’m home now, and working on recovery. Here are my extra legs for the time being . . .
And here is my comforter when I’m resting on the couch . . .
Because I have a son (“The Batman”) who has long struggles with handwriting and printing, I was very pleased to be given for the purpose of this review The 3 Step Pencil Grip Training Kit . We also received the The Ultra Safe Safety Scissors. Both product were sent to us from The Pencil Grip, Inc. and I think both products are wonderful for either young children, or those with poor motor control, such as my son. The Pencil Grip for the final step! The 3 Step Training Kit contains three different grips. For beginners, we have the crossover grip, which has wings to keep the fingers from crossing over, promoting a proper grip. Next, we have the pinch grip, which gives some structure while allowing a little bit of freedom at the same time. Finally, there is the pencil grip, which gives comfort, control, and can be continued as an extended use tool. 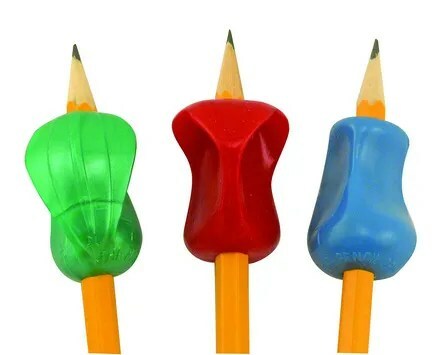 One thing I really like is something that makes the pencil grips easier for children to use. there is an L and an R on the grips. These are to show your child where to put his or her thumb, based upon whether the child is right-handed or left-handed. This is a very nice, thoughtful touch. 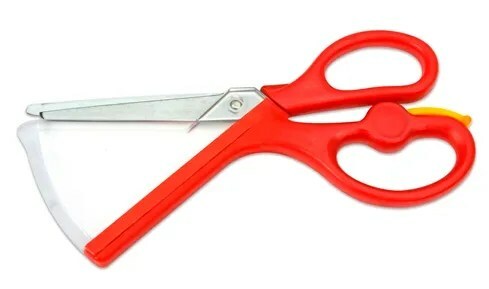 The Ultra Safe Safety Scissors really are just that! They are not dull at all, but they are made with a shield (which you can see in the above picture). This safety shield protects your child from being able to get his or her fingers in between the blades, which I find a good thing, as it prevents those cut fingers which we see often with regular sharp scissors! They are easy to open and close, partly because of the little yellow lever you see above. The handles have a nice fit. Even I tried them, and it was very comfortable for me to fit my fingers into the spaces. The only thing we found bothersome is that while yes, the protective shield DOES protect little fingers, it also makes it hard to get a clean-cut, if a beginner or someone with poor fine motor control is trying to use them. At the same time, I love that there is a permanent shield. The shield is not going to come off. That is helpful when you have (as we have) one child who has misused scissors frequently. Please click on the banner below to read 69 other fair and honest reviews of the Ultra Safe Safety Scissors and the Pencil Grip 3 Step Training Kit. Just Got Back From Pre-Op! So, two weeks from today, I will be in the hospital having a total knee replacement on my right knee. I have to have both knees done, but the left one will have to wait a while, as our out of pocket will take time to pay off. They don’t like to do both at once because it makes recovery harder. I had my pre-op appointment today, for blood work, etc. I thought it was for yesterday, and went all the way out there for nothing! Boy, was that embarrassing! But, we’re alol set now, and they will phone the day before to tell me what time. What We’re Eating Lately . . .
You all know I’ve been doing freezer prep meals lately . . . so here’s what we did this time! Filling the Freezer Bags . . . Done filling the bags . . .
And a freezer filled with 2 each of 5 different meals! Here are some of the completed meals, plated and ready to eat! Our family has very much enjoyed the Apologia Exploring Creation Through . 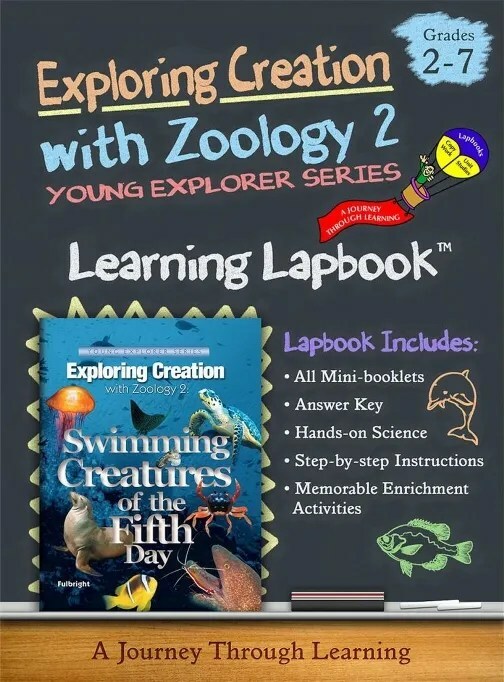 . . books for some time, so when we were given the opportunity to review the Apologia Swimming Creatures of the Fifth Day Lapbook From A Journey Through Learning Lapbooks, We were very excited! A Journey Through Learning Lapbooks have such an abundance of wonderful Lapbooks that you and your children can learn with, enough really, to cover several years worth of education! I really like the Learning Lapbooks created to go with the science education books written by Jeannie Fulbright. They are written from a definite Christian perspective, which I so appreciate. So many non-Christians seem to believe that we don’t believe in science, but the truth is that science was CREATED by God. This project has been fun for “The Artist,” because he really enjoys learning about sea creatures, and is constantly watching programs about swimming creatures on the Science Channel and National Geography channel. The Lapbook itself takes 13 folders, but as homeschoolers will do, we tweaked it a bit and used a notebook instead. “The Artist” chose green and blue card stock because they are colors from the sea. Each lesson gives very specific instructions for what to do, right on the page with the mini books to be cut out and glued into the section. “The Artist” kept the various booklets in separate zip bags until he was ready to glue them into the book. Each lesson component also tells the student where in the textbook to read in order to find the information he or she needs to write in the mini book, something that I personally like. It means that whatever level your student is at, he or she should be able to handle it. We printed the color version of the cover for “The Artist” to put into the clear cover insert of his notebook. He was very happy that we were able to do this in a notebook as opposed to the file folders, given that he has done many lapbooks and wanted to do one in a notebook instead. Here he is working on the various chapters, and showing them in his book. As always, we really love A Journey Through Learning Lapbooks, and highly recommend them! Apologia Exploring Creation Lapbooks-Fun Size! To read the other 69 reviews, please click the banner below!